Humans are endowed with the mechanisms of consciousness. We have an inner operating system which makes it possible to wake up and stay awake and to become aware and conscious. Our human vessel has a highly refined brain and sensory system. When awakened and trained we can acquire an impressive level of sophisticated sensitivity, which makes it possible to live consciously instead of unconsciously. We become sensory humans. Our personal relationship with our own energy is a vitally important aspect of our sensory system. In fact, the cultivation of our sensitivity to energy, in the many ways that this manifests, is the basis of our path to conscious awareness. You will notice this theme played out in many different ways in these lessons and continues to do so in my Guru Rattana Blog. As you identify the themes that resonate with you, use them to establish an energetic relationship with yourself. As you do so, you will actively embody the new energies of the Aquarian Age. These are revolutionary times. It is my prayer that you enjoy the power, potential and the positive heart-centered energy that are available to all of those who choose to tune in and turn on with gratitude and grace. Awareness, seeing, and perception are awakened at the crown and third eye. Listening is the faculty of the throat or 5th chakra. Feeling is the faculty of the lower, 1st and 2nd chakras and solar plexus. As we awaken our inner-sensory faculties, we connect with two basic communication mechanisms of the Soul: (1) intuition and (2) instincts. Our intuitive mechanism communicates for the awareness polarity of our Soul. It operates from our neutral mind and delivers pure knowledge, clarity, and insights. Our instincts operate from our emotional and physical bodies, which communicate for the feeling polarity of our soul. Our emotions and the sensations in our physical body deliver instinctual messages. The two polarities of our soul express through awareness and feeling, which are the two primal faculties of our human sensory system. The two words — awareness and feeling — are touchstones that we can use to evoke pure experiences and to activate the sensory communication faculties of our soul. Awareness is the faculty of the upper chakras/mind — that which stays constant, stable, and neutral. Our awareness faculty defines our operating paradigm and sets the tone of our projective space, attitude, and altitude. Feeling is the faculty of the lower chakras/physical and emotional bodies — that which always changes and transforms and flows. Our feeling faculty attunes us to and gives us information about our current reality. Listening is the connector faculty. Listening connects the head and the body. And listening is the activator faculty. Deep listening awakens both awareness and feeling. Our rational/dual mind is our translation service. NOTE: Thinking is an invaluable mechanism that we use to operate in the world, but it is not a primary faculty of our sensory system. Emotions are the senses of your soul. Recognizing emotions as guides and allowing them to help you transcend suffering and thrive will lead to a peaceful, abundant life. 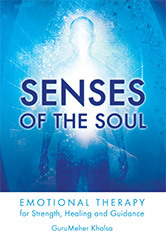 This book provides a complete training in the benefits and use of your emotions. It contains both the information and the practical experiences you need to change and grow. For over 30 years GuruMeher has studied, practiced, and taught innovative and effective techniques bringing growth, change and happiness to thousands of people, through Kundalini Yoga, life coaching and public speaking. By paying attention to our sensory messages, we can direct ourselves out of emotional, mental, and sensory overwhelm. With expanded awareness we can face our life challenges consciously instead of emotionally and unconsciously. Our spiritual journey is about learning how to maximize our use of these faculties of consciousness. Did I understand what he said and begin listening? No! We didn’t then understand a lot of what he said in those early years. You will find a summary of Yogi Bhajan's lecture in Issue 24 (Humanology Shift to the Aquarian Age) of The New Millennium Being. We can make quick progress cultivating our sensitive awareness if we practice every day. Do any Kundalini Yoga exercise or meditation for one minute or more and then sit and listen, be aware, and feel. When you drift off or start thinking, do another exercise (or the same one) for as long as you like. Between each exercise, look and listen inside your skin and feel the sensations in your body. Simply (1) practice exercise, (2) pay attention, be aware, and feel. Then take as much time as you can to remain attentive and to be aware of the space, silence, or stillness inside your head and to feel the sensations in your body. Do this exercise for 5—30 minutes every day, and you will make significant progress. After a few days, you won’t believe how easy it is to stay present in feeling, listening awareness. You will soon establish inner listening and feeling awareness as the default focus of your sensory attention. It is critical to remember that the domain of mental or upper chakra awareness is elusive and slippery and must always be balanced and integrated with grounding in physical reality, which happens by feeling the sensations in your body. So aware and feeling — the two polarities of our Soul — go together. Together they open our heart, which resonates with both awareness and feeling. (1) Be aware. (2) Be awake. (3) Observe. (4) Pay attention. (5) Listen. (6) Feel. Between exercises, focus on your peaceful space and the rhythm of your breath, and feel the ever-changing sensations cursing through your body. Identify which experiences pull you inside, make you more aware and awake. Pay attention to what is pleasant to feel and comforting to be absorbed in. The above lesson is an edited version of a more detailed explanation which appears in Guru Rattana's book - The Inner Art of Love. We recommend that you obtain this publication for further study, both of this and a number of other key Kundalini Yoga topics. Sit in easy pose, Bring the chin toward the chest, holding neck lock throughout the meditation. Cross arms over the chest, left under right, hands under armpits, "like you used to pout when you were a child." Make an 0 with the mouth. Continue for 11 or 31 minutes. During the last two minutes, chant RA MA DA SA SA SAY SO HUNG. To end, inhale deeply, suspend the breath (hold the breath while relaxing the body), squeeze the entire body and stretch the spine. Exhale. Repeat 2 more times. To learn more about the healing mantra RA MA DA SA SA SAY SO HUNG, see lesson 23.